The world's most revered and eloquent interpreter of evolutionary ideas offers here a work of explanatory force unprecedented in our time--a landmark publication, both for its historical sweep and for its scientific vision.With characteristic attention to detail, Stephen Jay Gould first describes the content and discusses the history and origins of the three core commitments of classical Darwinism: that natural selection works on organisms, not genes or species; that it is almost exclusively the mechanism of adaptive evolutionary change; and that these changes are incremental, not drastic. Next, he examines the three critiques that currently challenge this classic Darwinian edifice: that selection operates on multiple levels, from the gene to the group; that evolution proceeds by a variety of mechanisms, not just natural selection; and that causes operating at broader scales, including catastrophes, have figured prominently in the course of evolution.Then, in a stunning "tour de force" that will likely stimulate discussion and debate for decades, Gould proposes his own system for integrating these classical commitments and contemporary critiques into a new structure of evolutionary thought.In 2001 the Library of Congress named Stephen Jay Gould one of America's eighty-three Living Legends--people who embody the "quintessentially American ideal of individual creativity, conviction, dedication, and exuberance." Each of these qualities finds full expression in this peerless work, the likes of which the scientific world has not seen--and may not see again--for well over a century. This volume describes the content and discusses the history and origins of the three core commitments of Darwinism, examines the three critiques that challenge this Darwinian edifice and proposes a system for integrating these commitments and critiques into a structure of evolutionary thought. By literary standards [ The Structure of Evolutionary Theory ] is unique, a combination of scientific argument, historical analysis both of this argument and of all that went before it, an apologia pro vita sua, and many entertaining diversions...It is hard to think of any one else with this combination of polymathic ability and of sheer cheek, and equally hard to imagine filling a scientific auditorium with people who have read it right through--one of several ways in which the book can fairly be likened to The Origin of Species . Fascinating, discursive, dogmatic, intensely personal and often quite technical, The Structure of Evolutionary Theory is also in most of its sections readily accessible to lay readers--and well worth the effort...This summation of Gould's idiosyncratic life work will undoubtedly arouse tremendous enthusiasm in loyal Gouldites...Gould's detailed arguments and scholarly exegesis of the historical literature on evolution's forebears and conflicts fully justify the length of this book. But the nuggets of Gould, the literate and rambunctious scientist, give it delicious flavor on page after page...This is a brilliant, controversial, thorough and immensely readable updating of Darwin. For all its rigorous detail and painstaking historical, scientific, and philosophical explication, Gould's massive work is profoundly personal and dramatic, laced as it is with his great love for Darwin, frank intellectual autobiography, and his belief that the history of evolutionary thought "constitutes an epic tale"...[E]very scientifically inclined reader, will be affected by some aspect of Gould's passionate argument, humanistic sensibility, and sheer pleasure in the noble pursuit of knowledge and understanding. Stephen Jay Gould doesn't hold anything back in this remarkable and important book. Impressive on many levels, The Structure of Evolutionary Theory represents Gould's all-out attempt to revise and extend evolutionary theory as proposed by Darwin in 1859...Gould's respect and admiration (I would even say, love) for Darwin as a scientist and as a man have been evident throughout all his writings, and this book, which begins and ends with Darwin, is no exception. In stating his motivation for it, Gould leaves no doubt that his goal is not just to explicate evolutionary theory but to laud Darwin as well...While presenting a case that should strengthen his own place in history, Gould also makes it known that he is preserving the legacy of his mentor as well, at least for now. Stephen Jay Gould was no lightweight, physically or intellectually. This vast book...unveils his distinctive vision of evolutionary biology--as it should be, as it is, and as it has been...A book of great power, scope and learning...It is a book that one would expect to read and reread, for Gould articulates and defends a distinctive vision of the agenda of evolutionary biology; of the mechanisms of evolutionary change; and of the relationship of evolutionary biology to its own past...There is, indeed, a certain grandeur to this view of life. Stephen Jay Gould's work always generates keen interest and the present volume perhaps more so given his recent death. 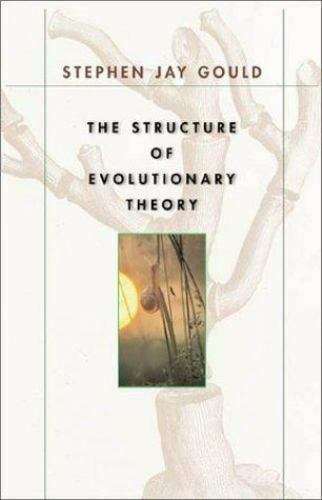 It is a thoughtful and technical book--a statement of position and a response to critics--and it is huge...It is not a textbook as the title might suggest; instead, it is evolutionary theory as viewed through Gould's unique vision. The Structure of Evolutionary Theory was, we are told, ten years in the making, and is in many ways likely to be seen as Gould's greatest achievement. Of the enjoyment that many hundreds of thousands have gained from reading Gould's essays there can be no doubt...[T]here is no doubt that this is a profound and major contribution to evolutionary theory, standing high above the smoke of battle in the Darwin Wars. The culmination of about 25 years of research and study, this book traces the history of evolutionary thought and charts a path for its future...This book presents Gould in all his incarnations: as a digressive historian, original thinker and cunning polemicist...Even Gould's opponents will recognize this as the magnum opus of one of the world's leading evolutionary thinkers. [A] magisterial tome...[ The Structure of Evolutionary Theory ] is destined to go down in history alongside the writings of Galileo, Darwin, Huxley, Freud, Mayr and others as a work that will change its culture forever. Gould's critics (and there are plenty of them) may weep and gnash their teeth at such an assessment, but they ignore him at their--and our--peril. This man has something important to say about the preeminent origin myth of our age--evolutionary theory--and he has said it in this magnificent work. [This is] a summation of Stephen Jay Gould's life work, building on Darwinism to provide a novel synthesis of how evolution has shaped the living world...One of the joys of reading about good science is the chance not only to observe how scientific theory works, but also to participate in the workings of the mind behind the words. In Gould's... The Structure of Evolutionary Theory, the reader will find such joy in abundance. The Structure of Evolutionary Theory by Stephen Jay Gould is a phenomenal work which takes a lot of commitment to read, but is well worth the trouble.